Does Aquaman need a car? Of course not! But who cares when the ride is this sweet? 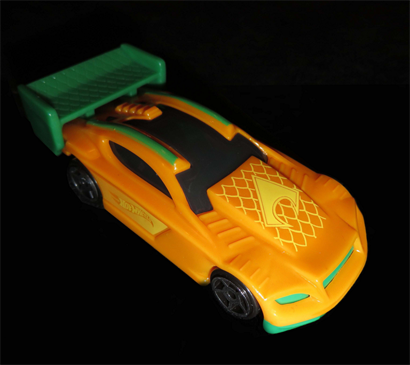 This is the Aquaman Hot Wheels car currently available at McDonald's, as part of their Happy Meal campaign. This was a real team effort--the photo was sent to me by F.O.A.M.er Barry Fackler, and the car itself was designed (along with all the others in the DC Comics set) by F.O.A.M.er Luke Daab, Senior Art Director of Digital, Creata. Our own Luke designed that! Awesome sauce! I love these things! Great job! I WISH I designed the car. McDonald's currently uses two agencies for all of it's Happy Meal Toy Designs. For this DC/Hotwheels promotion, the cars themselves were designed by the toy designers at our competitor. Where MY work comes in is on the Happy Meal App, McPlay! McPlay is a free app with game content customized to each toy promotion. Using the app, you can scan your Happy Meal toy and unlock a unique game! My Creative Director composed most of the artwork for the DC/Hotwheels racing games, while I assisted on the Splash Pages and sourcing/creating SFX for each character's game. (I was also utilized as a superhero expert during the conceptual phase.) ;) I especially enjoyed finding an epic and kingly score for Aquaman's race. I did my best to pay homage to Aquaman's telepathic "boop boop boop" during a specific sequence as well. If you get the chance, download and leave us a positive rating! Our work is up for review soon and every star counts! That's awesome Luke! Great job!